Dubbed the ‘populist move’, the Farmer Crop Loan Waiver Scheme has been announced by the current state government in Karnataka. The implementation of the Crop Loan Waiver Scheme will be done no sooner than later. The scheme aims at bringing betterment for the farmers, specifically the poor agricultural workers. The scheme will offer immense benefits to the farmers who have applied for the loans concerning the agricultural requirements, for they can easily apply for the registration process. The launch details and the primary motto of the Farmer Crop Loan Waiver Scheme have been given below in the tabular format. The key features of Farmer Crop Loan Waiver Scheme have been mentioned right below in a point-wise format. Initiates in developing the state farmers – The scheme will be of huge benefit to the farmers as it initiates for the development of the state farmers of Karnataka. It will also provide the respite from the burden of agricultural loan payments. Encouraging the non-defaulters – The scheme has been announced to offer encouragement for the non-defaulters as well. The scheme is of huge benefit for the farmers who have never missed any of the loan payment. And thus, it will offer a total of Rs. 25,000 for encouraging the non-defaulters. If some portion of the loan is left unpaid, then the government will do the necessities on their behalf. Lowering the expenditure of the Government – The implementation of this particular scheme will pay a huge benefit to the applicants. This includes the state authority in cutting down the unnecessary expenditures that will offer some financial provisions of the particular scheme. Budget to be waived off – Releasing a lot burden from the farmers, the new scheme is set to offer a total budget of Rs. 2 lakhs. Profit in the product – With the implementation of the Farmer Crop Loan Waiver Scheme, it will prove to offer massive profit in the agricultural products. Increasing the duty – The Karnataka Government will bring in multiple benefits. This includes offering a hike in the existing duty. The exact number of the beneficiary – 17.32 lakhs of workers in the agricultural industry will be benefited. Alongside, a total of 27.67 lakhs of agricultural workers will be receiving Rs. 25,000 as an encouraging amount. Distributing the certificates of the loan waiver – The state authority will soon initiate in starting the task of distributing the certificate of the farm credit waiver from 8th of August. Bank Money to be paid – Waiving off the loan involves a whopping amount of Rs. 34,000 crore which the Government has to pay to the banks. The eligibility of Farmer Crop Loan Waiver Scheme have been mentioned right below in point-wise information. First, the ones who will be availed of the benefits of the scheme are the agricultural labors. But there are certain restrictions, such as the agricultural labors must be permanent and have to be the local residents of the state. Second, the farmers who have applied for the agricultural credits less than an amount of Rs. 2 lakhs will be applicable to get the benefits of the Farmer Crop Loan Waiver Scheme. Third, the ones who have taken a credit in between April 1, 2009, to December 31, 2017, can get the benefits of the Crop Loan Waiver Scheme in Karnataka. Fourth, as per the estimations, this particular scheme will give the allowance of the enrollment of the marginal as well as smart farmers too. Fifth, the farmers who haven’t yet paid their respective taxes over the past three years are restricted to get the benefits of the Crop Loan Waiver Scheme. Sixth, the farmers who have acquired the loan schemes from either nationalized banks or cooperative finance institutions will be eligible to get the benefits of this particular scheme. Seventh, the State Government will only consider the application of the candidates only if the farmer’s family is not associated with the Government sector or job. If any of the members of the farmer’s family is linked to Government offices, then the farmer is barred from the scheme. Eighth, farmers will be unable to get the benefits of the scheme only when the family member of the candidate is associated with any cooperative sector or office. Ninth, if the agricultural labor has taken the loan against their property like jewelry or automobile, then the scheme is not applicable for that particular farmer. Tenth, in case the farmer happens to be an elected representative of the village, then the scheme is not appropriate for the candidate. The below-offered mentions are the documents necessary to apply for the application form which will offer immense benefits of the Farmer Crop Loan Waiver Scheme to the eligible farmers. Aadhar Card – The Aadhar Card has to be submitted in order to get the benefits of the scheme. Papers related to Credit – Applicants must get the photocopies of all the credit-related documents. Details of the Applicant’s Bank account – Bank account is something which is vital for the candidates to attain the benefits of the scheme. Documents of the Resident – This is necessary to ensure the legal and permanent residents of the state. Documents related to Farmer registration – Candidates must provide the necessary farmer related documents which can ensure that they are totally associated with the agricultural industry as the key occupation. The procedure of registering for the Farmer Crop Loan Waiver Scheme doesn’t include any specific mentions about the process of filling up the application form. The method for applying for the process clearly depends on the enrollment. However, it is very early to anticipate anything regarding the procedure for getting the Farmer Crop Loan Waiver Scheme’s application form. The Farmer Crop Loan Waiver Scheme has just been announced by the state government during the Karnataka budget’s presentation. As of now, only a couple of important things regarding the details have been mentioned in the current scheme. Therefore, the conclusion cannot be given at this point of time as it is too early. The details will be available for common people shortly. Step 2: Second, one has to visit the ‘Services for Citizen’ option from the homepage. Step 3: After which, one will notice three choices namely ‘Individual Loanee Report’, ‘Citizen Payment Certificate for Banks’, and ‘Citizen Payment certificate for PACS’. The beneficiary farmers have to opt for any one option out of the three choices. Step 4: For the farmers who choose the ‘Individual Loanee Report’ option can access all the individual loanee report by paying a visit to this link – http://clws.karnataka.gov.in/clws/pacs/citizenreport/. Here, the eligible candidates will be availed with all details of the commercial bank loan, PACS loan, bank payment, and PACS payment. After getting the details, one has to click on the ‘Print’ option. Step 5: For the ones who opt for ‘Citizen Payment Certificate for PACS’ can only get the access through – http://clws.karnataka.gov.in/clws/payment/pacscertificate/.The certificate for citizens for this scheme will appear on the screen. The beneficiaries can find details with the use of their ration card number, Aadhaar card number, and FSD ID. Step 6: For the ones opting for the ‘Citizen Payment Certificate for Banks’ can get the access by using their payment certificates for Banks and directly click on this link – http://clws.karnataka.gov.in/clws/payment/bankcertificate/. After this, the candidates will see the commercial sector’s payment certificate on loans for Crop Loan Waiver appearing on their screen. Right here, candidates will have to find the details by using their Here candidates can get find their details of loans through taken from commercial sector by using their ration card number, Aadhaar card number, FSD ID. The Farmer Crop Loan Waiver Scheme has recently been announced by the CM of Karnataka, Kumaraswamy. Concerning the state budget, the scheme at least requires a minimum of Rs. 6,500 crore, which is anticipated to be utilized to wave off the credits of the farmers, those who have borrowed loan for their agricultural purposes. According to the recent report, the common agricultural labor queue of the state has a lot of expectations from this particular crop loan scheme. Although the State Government of Karnataka has already taken a leap by announcing the scheme, they are yet to leave no stones unturned by making the scheme advantageous for the eligible candidates. 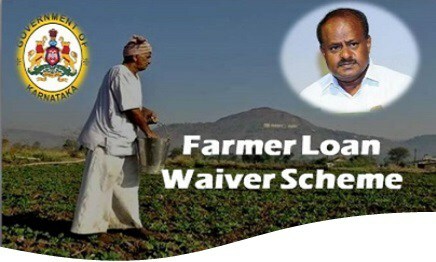 Earlier, the Karnataka government has announced several loan waiver schemes for the poor farmers of the state. The state authority has yet again announced that all such agricultural labors, who have borrowed money from nationalized banks, will be able to get the benefits of the new loan waiver scheme. Those farmers who had taken credit from nationalized banks but have already repaid the money on time will also be able to attain some incentives from the state government. A rough estimate states that Karnataka government will have to shell out around Rs. 30,160 to waive off these loans. As the financial institutions are in no mood to side with the state and waive off the interests on these credited amounts, the state will have to spend additional funds to compensate the interests as well.